The Cruise Control Module was a Dealer Fitted option on many Falcons, and was fitted standard on Fairmonts, Fairlanes, and LTD models. Its purpose is to hold the vehicles speed when activated, by opening the Throttle Body, and maintaining adequate Acceleration to hold a constant Vehicle Speed. The Cruise Control Module does not however Activate the Vehicles Brakes, to reduce the Vehicles speed. This Document Describes the operation, installation, and Testing of the EF and EL Model Ford Falcon Cruise Control Module. The Cruise Control System provides automatic speed control above 40Km/h, under normal driving conditions. The system is activated by switches mounted on the steering wheel. Below 40Km/hour, the system will not operate. WARNING : To avoid the possibility of loss of control, the cruise control should not be used in heavy traffic (City Driving), or on winding, slippery, or unsealed roads. Pressing the "On" Button will activate the Cruise Control system. The word "CRUISE" Will Illuminate on the Instrument Cluster to indicate that the system is active. Pressing the "Off" Button will switch the system Off. When pressed, the "CRUISE" Lamp will no longer be Illuminated. Press the Cruise Control "On" Switch to Activate the Cruise Control System. The "CRUISE" Lamp will Illuminate on the Instrument Cluster. Momentarily depress the "+ Set" Button, and release it. Do Not Hold the Button down ! (Note for EF Series I models, this button is labelled "ACCEL"). Release the accelerator and the Cruise Control Module will automatically maintain the current vehicle speed. Tap the "+ Set" Button again to further increase speed, or simply hold the "+ SET" Button down until the desired vehicle speed is reached. You can also accelerate the vehicle by depressing the Accelerator Pedal, until the Desired Vehicle speed is reached, then depressing the "+ Set" Button. Depress the accelerator pedal to increase the vehicle speed as required. Release the accelerator pedal to resume the pre-set cruise control vehicle speed. Depress the brake pedal to decrease the vehicle speed to the desired level. Tap the "+ SET" Button to set the cruise control speed to the current vehicle speed. Depressing the Brake pedal will Cancel the current Cruise Control Set Speed. Depressing the "OFF" Button on the Cruise Control, will also Cancel the current Cruise Control set speed. If the cruising speed has been cancelled by some method other than the use of the "OFF" button, (I.E. The "CRUISE" Lamp is still Illuminated on the Instrument Cluster), the last preset cruising speed can be resumed by pressing the "RES COAST" Button. NOTE : The last cruising speed cannot be resumed, if the current vehicle speed is less than 40Km/Hour. The cruise control Preset speed is deactivated each time the ignition switch is switched off. The Cruise Control System and preset Cruise Speed is De-Activated each time the ignition switch is switched off. The resume feature will not function if the system has been switched off by the "OFF" Button, if the Ignition has been switched off, or the Current vehicle speed is below 40Km/Hour. After pressing the "ON" or "RES COAST" buttons or depressing the brakes or clutch pedals, allow for 1-2 seconds before selecting either the "+ SET" or "RES COAST" button again. WARNING : When going up or down steep ascents and descents, it is possible for the vehicle to lose or gain speed, even though the cruise control is engaged. In which case, you may need to manually control the speed. During gearshifts, clutch operation will disengage the Cruise Control. As long as the vehicle speed is above 40Km/Hour, the previously set speed may be regained by depressing the "RES COAST" Button. On some uphill grades, the transmission may cycle between 3rd and 4th gears periodically. This can be avoided by down shifting from "D" to "3" to prevent the vehicle shifting into 4th Gear. These models have a stripped down Engine Bay wiring Loom, which is missing a few connectors, and Unfortunately cruise control is one of them. What you will firstly need to complete before even fitting the cruise control system, is to add the necessary wiring to the Engine Bay wiring Loom, for the cruise control module. 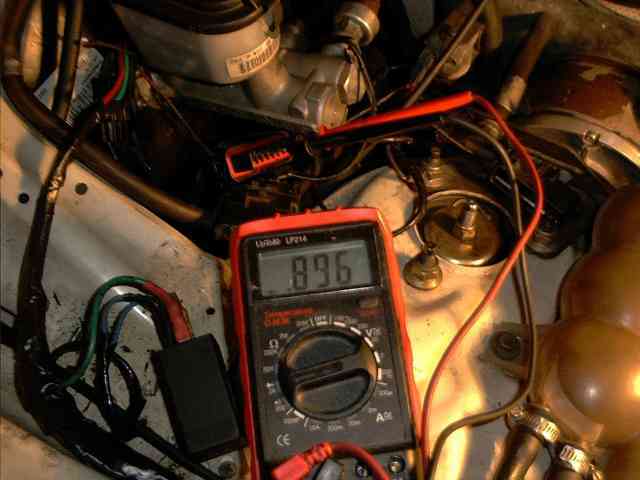 Luckily, this wiring loom can be purchased from Ford, and its subsequent part Number is EF10C975B. There will be more information for Non ABS equipped (GLi) Models shortly. To fit the cruise control System to ABS equipped vehicles is by far, much easier than Non-ABS vehicles. The reason for this is the different wiring Loom that is used for ABS Models. This wiring loom includes the Cruise Control Module connectors, as well as other connectors for functions such as Low Coolant Warning, Low washer Fluid warning, and Climate Control Ambient temperature sensor. Because of the existence of the Cruise control Connector on these models, adding the system should not take any longer than a complete day worth of work. Adding the Cruise Control Module (ABS Vehicles) Before carrying out any work, first disconnect the Battery Negative terminal. 1) If the Cruise Control Actuator line is not already connected, then you will need to do this now. 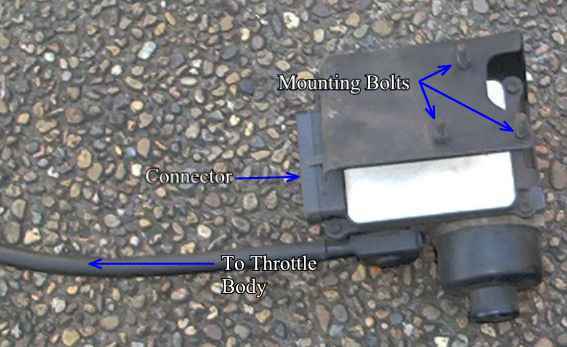 The actuator cable is the cable that connects to the Throttle Body, and the Cruise control module. To fit this line, simply align the Legs on the Cruise Control Cable Connector, with the circular connector on the cruise control module. Once these legs are aligned, simply twist the cruise control Cable connector roughly 30* Clockwise, to engage the clip. 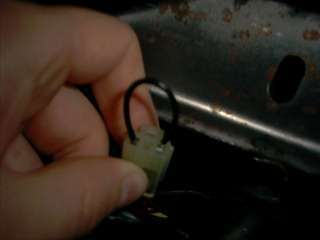 2) Next, you will need to remove the dummy connector from the Cruise Control Connector wiring loom in the engine bay. This Dummy connector is used to allow the Steering wheel Horn Buttons to function correctly. The connector is located towards the outside of the Brake Booster, underneath the Chassis, towards the Fender. 3) Once the above has been completed, you will need to connect the Cruise Control Actuator cable to the throttle body. The Actuator cable should run along side the throttle cable, and the end piece will simply slip over a flat ball connector on the throttle body plate. This throttle body ball connector is located just below the Spring, next to the accelerator pedal, Towards the firewall on six cylinder models, or Underneath the throttle body on 8 Cylinder models. Finally, the Cruise Control Actuator cable should come with a Mounting Bracket, that is used to help hold the cable in place, and not allow it to flop or foul any engine components. On Six Cylinder models, this bracket should be attached to the Rocker cover, along side the mounting bracket for the Throttle cable. On 8 Cylinder models, this bracket is located roughly 2 inches away from the Throttle plate ball connector. The Brake Booster pressure switch is used by the cruise control module to determine when the Brakes are applied, in order to disable the cruise control. This switch is also used as a fail-safe backup to the Brake Pedal Switch, for the cruise control deactivation. 1) First, remove the blanking plug on the Brake Booster. 2) Fit the Brake Pressure switch to the Brake Booster. This is achieved by screwing the switch in clockwise. 3) After this step, you should bleed the rear Brake circuit, as the installation of the Brake Booster pressure switch may have allowed air bubbles to seep in to the brake lines. This step is for Automatic Transmission Vehicles only, and is used to bypass the Manual Transmission Clutch Pedal Switch, (Which is obviously not used on an Automatic Transmission). This connect can be difficult to locate, and very difficult to short out. The connector should be located right up behind the fuse panel behind the Dash, and is a three-pin connector, with 2 wires coming out from it. The easiest way to located this connector, is to follow the wiring coming from the Brake Pedal switch, all the way up behind the Fuse Block. Once the connector is located, you will need to short out the link, using either a piece of wire, or by simply cutting the connector off, and connecting the 2 wires together. If you are using a wire to short the pins, ensure that the wire will be secured, and will not fall out, (As what happened to us on our test vehicle). The clutch pedal switch is used to Deactivate the cruise control module, whenever the clutch pedal is depressed. As per above, you will need to find the clutch pedal switch connector which can be difficult to locate. Once this has been completed, the Clutch Switch will need to be mounted at the top of the Clutch pedal. The Clutch switch is held on to the clutch bracket, by one screw. This bracket is located towards the back of the clutch pedal, near the Pivot mounting point on the Chassis/Firewall. Finally, plug the supplementary wiring loom in to the newly fitted clutch Switch. The Cruise Control Wiring for the steering wheel buttons are already in place, for these buttons. Only the Buttons need to be fitted, and connected to this wiring. Obviously, you will need to remove the Steering wheel Airbag, and will also need to cut the plastic on the Boss, so as to fit the cruise control buttons. 2) Remove the 2 plastic blanking plates, on the steering wheel boss. 3) Remove the 2 screws located behind these blanking plates. 4) Remove the Airbag, and Disconnect. Place the Airbag Face up, on a flat surface. 5) Remove the existing Wiring from the Steering Wheel Boss. This wiring is used to enable the horn to function properly, with out the Cruise control Buttons. 6) Remove the Plastic Shroud (Boss thingy), and Modify so as the Cruise Control Buttons can be mounted on to the shroud. You will need to cut roughly 9mm down on each side of the shroud, in order for the switches to fit properly. 7) Refit the Steering Wheel Boss shroud, and fit the Cruise Control Buttons, using the 4 Self Tapping screws supplied. 8) Connect the Cruise Control Button wiring, and tighten the steering wheel attaching screws to 45Nm. 9) Connect the Airbag, and Refit. 10) Fit the Airbag Mounting screws, and torque to 10Nm, and fit the Steering wheel blanking plates. Once you have completed the above operations, you cruise control system is ready for testing. It is recommended that you take the vehicle out to a long stretch of open road for testing, as the cruise control system may not activate until speeds of more then 55Km/Hr are reached. It is also recommended that you are prepared to switch the Cruise Control Off Manually, using the Steering wheel Off switch, just in case there are problems with either the Brake Switch, and Brake Pressure Switch. NOTE : The Cruise Control Module WILL NOT Function if the Brake Pressure switch is not fitted, and connected. The following Information will give you some idea of what to check, if your cruise control system does not operate. To properly carry out the following tests, you will require a multimeter, and of course, a Cruise Control Module fitted to a vehicle. Verify Proper Horn Operation : If the Horn does not operate correctly, then check Horn Fuse, Horn Relay, and wiring. Verify Proper Stop lamp operation : If the stop lamps do not operate, then check the stop lamp fuse, the stop lamp switch, the stop lamp globes, and the stop lamp wiring. All connections are complete, with no loose wires or terminals. Wiring is not shorted, broken, frayed or corroded, and all soldered connections are taped properly. Wiring has not been miss-routed, or improperly connected. The Cruise Control cable is adjusted properly, and does not hold the throttle open, or increase the base idle speed. The Cruise Control Throttle linkage operates freely and smoothly when connected to the actuator cable, and servo. Please note, the Wiring loom connector will have the Pin Numbers marked on both sides of the connector. Disconnect the Cruise Control Harness Connector from the Cruise Control Assembly. IS THERE BATTERY VOLTAGE ? IS THERE BATTERY VOLTAGE ON PIN 7 ? Yes - You must have goofed, try Test A AGAIN ! IS THE RESISTANCE LESS THAN 1 OHM ? Remove the Harness Connector from the deactivator Switch. IS THE RESISTANCE LESS THAN 10 OHMS ? IS THE VOLTAGE BETWEEN 5 AND 7 VOLTS ? IS THE RESISTANCE BETWEEN 800 AND 1100 OHMS ? IS THE CABLE OK ? DOES THE CONDITION EXIST WITHOUT CRUISE CONTROL ? ARE THE COMPONENTS OK ? DOES THE SYSTEM OPERATE PROPERLY ? IS THE RESISTANCE BETWEEN 114 and 126 OHMS ? IS THE RESISTANCE GREATER THAN 1 OHM ? IS THE RESISTANCE BETWEEN 646 and 714 OHMS ? IS THE RESISTANCE BETWEEN 2090 and 2310 OHMS ? IS THE RESISTANCE LESS THAN 4 OHMS ? IS THE VOLTAGE APPROXIMATELY 12 VOLTS ? DOES THE "CRUISE" LAMP ILLUMINATE ? IS THERE A SHORT ? Document written by: Matti on 18 2002>, Copyright © 2004 Matti, all rights reserved.